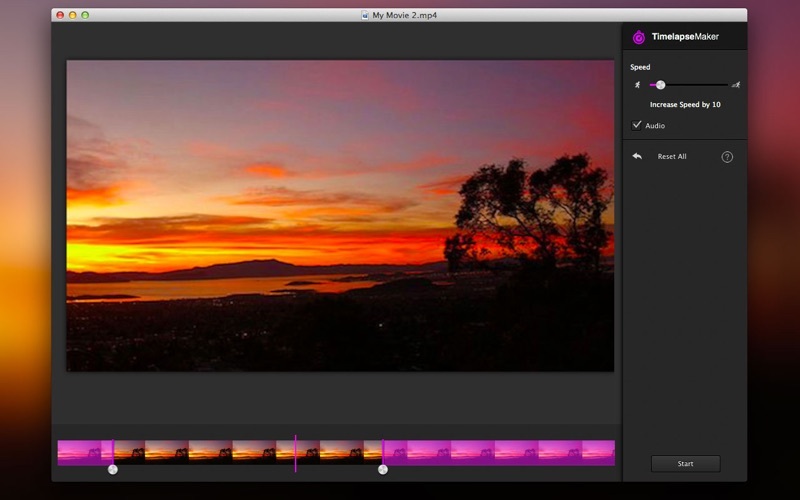 Transform virtually any video file into a time-lapse movie. Just select a video file and speed it up to 100 times. *Works with virtually any Quicktime® compatible video file. The app works well and does what you expect it to. A few flaws though that hopefully can get added in a future version. There’s no way to preview your speed. There’s no preview of how long the output video will run. Still, much faster than setting up an entire project in Final Cut for a very simple operation. Does exactly what it says. Outputs video in almost the same quality as recording, perhaps that must be why it takes so long. Glad I purchased it. Although there is no preview mode :\ So far I’m able to convert up to 3 videos at once! had a project on iMovie I need to do so I get this app without reading the comments before, and after I paid for it, and I click on it, all it says is “Drag File” No instructions, nothing, I don’t get what they mean by "drag file” which file? For heavens sake, all I wanted to do was make a time-lapse! READ THIS BEFORE YOU GET THIS APP, IT’S A RIPOFF! No frills but got the job done. It’s not anything fancy, just drag the file, pick how fast you want the movie to process and press start. Just what I needed. Worth the 4 bucks to me. I bought the program and have no idea how to use it. No help, details or controls to give me direction. Wish I hadn’t bought it. When I try to use it the program crashes every time. Not happy. The new version looks a little nicer. Funny thing is that the new slider for speed only goes to 99 instead of 100, and if you move it quickly the purple bar gets all chopped up. Opens to nothing: No splash screen, no get started. You have to know to click File>Open to start working. Still very slow in processing (it doesn’t do any itself, just calls to the OS media routines apparently). I did finally get it to complete one of my long movie conversions and the resulting movie was exactly what I was after: a time compressed movie of my security camera footage. I’d expected better performance and a little more interface for $3.99, but it is a simple; handy little utility.